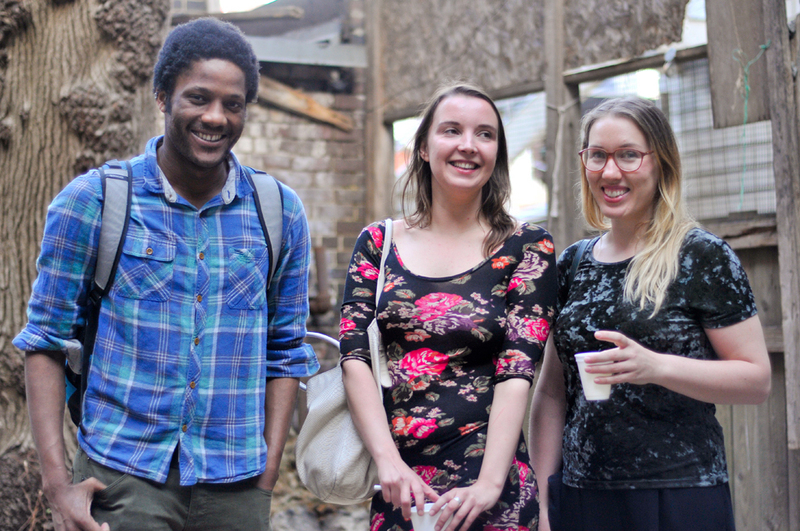 8-11’s Xenia Benivolski (middle) poses with artists Antonio Roberts and Jenine Marsh in her gallery’s “secret garden” backyard. Celebrating the “fine line between decadence and debauchery,” the theme of this year’s Power Ball is “Appetite for Excess“ on June 4th. It’s a fitting theme for Toronto’s best art party hosted by The Power Plant Contemporary Art Gallery. In a rare display of cohabitation, artists and art patrons will get sloshed together on Cîroc and dance to electro-pop. The ecosystem for the arts (buyers, sellers, makers, promoters) is represented under one roof and everyone shows up looking pretty great. From the look of the lineup–Chef Grant Van Gameren, Sam James, Bertrand Alépée and Winsome Brown–food will be king at Power Ball. That’s a bit of a shift from previous years that left guests clamouring for a stray sandwich to soak up all the booze. Kicking off the evening, there will be a food performance piece by artist Jennifer Rubell titled So Sorry. Her previous work includes spoon-feeding wedding dress to guest, smashing paprika from rubber chickens to season devilled eggs and using a mannequin as a nutcracker. Lips are tight about the Power Ball performance but it’s safe to say that it will be memorable. Other participating artists include Karen Kraven, Orest Tataryn, Swintak and 8-eleven. Each project will interpret “Appetite for Excess” in their own particular way. At the 8-eleven gallery opening for Jenine Marsh’s “The cut flower still blooms,” we met up with the collective’s curator Xenia Benivolski to wiggle out a few details of their upcoming Power Ball project. The result? An installation using limos, real limos. Benivolski revealed that partygoers will definitely go into the limos and “there might be a parking meter involved.” You’ll have to wait until June 4th to find out what’s really going on–until then, we leave you with this limo clip from Romy and Michele’s High School Reunion.